Through her messages and miraculous Image, Our Heavenly Mother awakened the Aztec Indians to their centuries-old delusion of worshiping and dreading the false gods and the cruelty of sacrificing the lives of hundreds of thousands of innocent people per year to appease the false gods, and turned their eyes and hearts to the True and Merciful God. Our Lady also invited and urged them to intimately and totally trust and rely on her, who is the perfect Mother of the True God as well as their most merciful and caring Mother. As a result of Our Lady’s continuing prayers and other efforts, the Catholic Faith spread to all corners of Latin America, which now is the Continent with the greatest number of Catholics in the world. Outside Latin America and some parts of Europe like Spain, the details of the messages and the miraculous Image of Our Lady of Guadalupe have not been widely known. Many people still think or feel that Our Lady of Guadalupe is for Mexico and other areas in Latin America only. This perception is very incorrect, as Our Lady made it clear in the above message that she is the merciful Mother of all mankind who love her, who cry to her, and who have confidence in her. We must know that Our Lady came to Mexico in 1531 not just to convert Latin America but, more importantly, to convert and save the maximum number of people in the world. It appears that Our Lady of Guadalupe did concentrate on the evangelization of Latin America in the past 500 years, but, especially now, her flaming concern is about the evils and dangers that threaten the entire countries and individuals in the world. 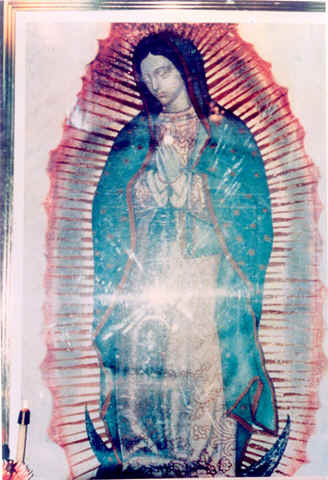 That is why she revealed new images or signs in the photograph of the Missionary Image of Our Lady of Guadalupe taken on August 15, 1991 in Portland, Oregon such as: (1) the images of the Holy Eucharist and the Holy Spirit urging us to restore the discipline of the authentic Catholic Teachings and Devotions, (2) her weeping, kneeling and praying image to end all abortions, (3) the images of the Crucifixion to remind us of Our Lord’s suffering and death on the Cross for our salvation and to exhort us to repent our sins and do penance for them. Our Lady wants us to realize that the only way we can avoid eternal disaster is true penance for our sins and reformation of our lives according to the Lord’s Teachings and by relying on and praying with Our Lady. 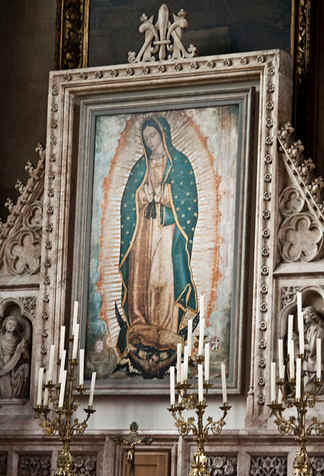 The Missionary Image of Our Lady of Guadalupe was donated by the Mexican Bishops’ Conference to the Catholic Church in the USA and has been touring Catholic churches in America since the spring of 1991. The 4x6”color photograph being distributed by us now is exactly the same as the original photograph taken on August 15, 1991 in the chapel of the National Sanctuary of Our Sorrowful Mother in Portland, Oregon by a lowly layman, born in Korea but a US citizen since 1982. When you receive this photograph, you receive not a photographic replica or drawing but a photograph identical to the original photograph thanks to the modern digital technology. This is another Divine Wisdom that makes the original photograph of August 15, 1991 available to every person in the world. As you may also know already, the original Image of Our Lady of Guadalupe that appeared on Juan Diego’s cactus fiber tilma almost 500 years ago was not a human product at all but was a gift truly from God Himself through Our Lady. For this reason, this Image of 1531 has been revered and loved as one of the most precious and holy treasure in the Catholic Church throughout the past five centuries. The images in the photograph of August 15, 1991 are not human products, either, and, therefore, we must also keep and cherish this photograph with utmost care, joy, humility, respect, love, and gratitude. By doing so, we will give more praise and glory to the Lord and, thus, we will also receive more blessings, while neglecting or despising the Images will give an indifference and insult to God and Our Lady. Miracles have already occurred through this photo-graph: some people smelled the heavenly fragrance of roses, others experienced evil spirts repelled out of their homes, a couple who had decided to divorce reconciled and reunited after seeing this photograph, and many others are motivated to love God and love people through this photograph. Also enormously important is the bright light spreading in all directions from the Image of the Blessed Mother in this Special Photograph. Soon after this photo had been taken, we only thought that this light was just a reflection of the camera flash. It indeed was a reflection of the camera flash, but it is playing a very important role that brings us closer to God and His graces. In this photograph, there is no single recognizable image that does not contain some important teaching, encouragement, or warning. This photograph is God’s exclusive stage where He reveals what we need to know in this critical end time when the world will be cleansed and a new world of peace and love will be established and ruled by Our Lord. Another example similar to that of the reflection of the camera flash is the reflection of a window of the chapel on the Blessed Mother’s upper right side. This also took us some time to recognize it as the image of the Holy Spirit in the form of a dove. We were greatly amazed and moved when we saw the Holy Spirit looking at the Blessed Mother and also at us (more detailed explanation is in our website). Returning to the case of the camera flash, this light from the camera flash is being divinely used as the Light of God. In the New Testament (1 John i. 5), it is said, “God is light”. This Divine Light infinitely exceeds all created lights in dignity, beauty, and power, as it contains all the holy and good natures that belong to God. Those who are already in Heaven continuously see this Light of God and will live in it. On the other hand, devils extremely fear this Light; they simply run away as soon as they see the Divine Light. It takes time and efforts to deeply understand the meanings and power of this Image of Our Lady and other images in this photograph. We hope everyone will become closer to this photograph and make good progress in loving Our Lord in the Eucharist, His Holy Spirit, His Mother and others including unborn babies.